High-school senior Tara Frey, from Wisconsin, won’t have to worry about having the same prom dress as other girls, as her mother has made her a unique outfit from thousands of Starburst candy wrappers. Tara and her mother Kerrin worked on the dress for the last six years, trying to collect as many wrappers as possible before the big event. Kerrin Frey told local news station KARE-TV that she got the idea for the wacky project after seeing another mother weaving gum wrappers during a hockey game. The two started collecting Starburst wrappers, but had to go the extra mile in order to complete the outfit in time for the prom. 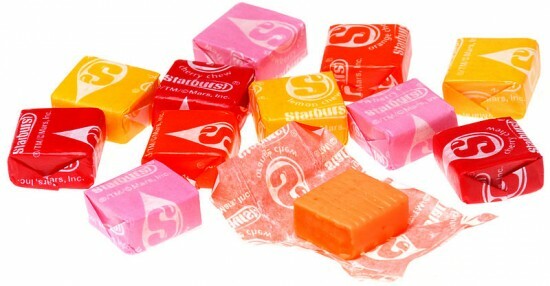 They tried calling Starburst to ask them if they could only buy the wrappers from them, but they weren’t too keen on the idea, so they had to buy up to 9 kg of candy at a time. They handed them to neighbors and friends, but asked them to keep the wrappers and try not ot tear them. In order to be used for the sweet prom dress, every candy wrapper had to be folded eight times, and pressed with tweezers to achieve a tight weave. Not the easiest of tasks, considering there were a lot of wrappers to prepare, so Kerrin asked for help from her friends. She doesn’t know exactly how many Starburst wrappers were used on Tara’s gown, but she does remember it took five failed attempts before the two of them agreed on the design. will fit perfectly with the theme of the big party – the board game Candyland.